Flipping through the latest issue of Midwest Living yesterday, I found an article about fairy gardens. Apparently they're the hottest new variation on terrariums. While I'm not really into imaginary fairies, there is something appealing about miniature versions of pretty much anything. Anybody remember The Littles on TV? It was a cartoon on Saturday mornings when I was, well, little, and I loved it and desperately wished some tiny people would come live in our house. So making a mini garden might be just the thing to do with a small girl you know. Use herbs planted in a container to mimic little hedges, bushes, and trees; then add a gravel path or pond. (Find more info here.) If you want to accessorize, get benches and other goodies at The Garden Barn's Etsy shop. Or make your own chairs from champagne bottle packaging by following today's DIY instructions at Design*Sponge. That's adorable. What a great idea! If only I had room for more plants. Oh...so cute. And you seen the hobbit/fairy doors here? When I discovered the doors a few weeks ago I decided this was a project we'd have to put on our list. Seeing all these other wee accessories is making me even more eager. I just may have to try one of my own. They are so cute and I love having fresh herbs at the ready to cook with. wonderful idea if there is not garden space or too many plant pots! I'm really, really glad those Littles didn't come to live in our house back then. The Littles were a book series before tv, i think...I loved them and thought they lived in our attic. I was going to comment in The Borrowers, too. I love them. And not a little. that is the cutest darn thing I have ever seen! Oh now you've gone and done it. IMAGINARY FAIRIES???? Wooooooo, I'd mind my P's and particularly my Q's were I you. There is no such thing as an imaginary fairy. They are real. Make a fairy garden, tend it with a good heart and you'll see. There's still a little girl inside who knows that to be the truth. Look there and believe. Oh faeries do exist lol. Anywhoo, I too miss the littles. I loved watching that when i could. Ooh! I love that little chair! You are a 'category winner' in my '25 Best Blogs of 2009'. Congratulations! See the other category winners and your mention (and link)here: http://www.cricketwife.com/2010/01/25-best-blogs-of-2009-part-1.html. Love The Littles. Love the champagne wire chair. Love the mini garden! I definitely want to surprise my 5yr old daughter with a fairy door somewhere in our house. 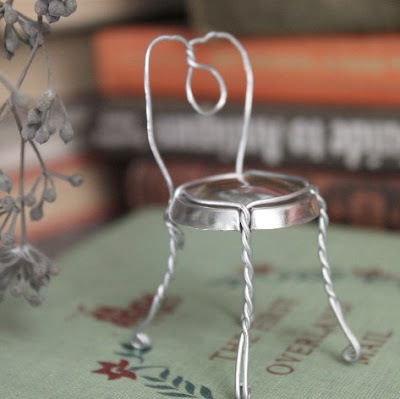 Thats a very cute one and I love the little chair made from a champagne cap. 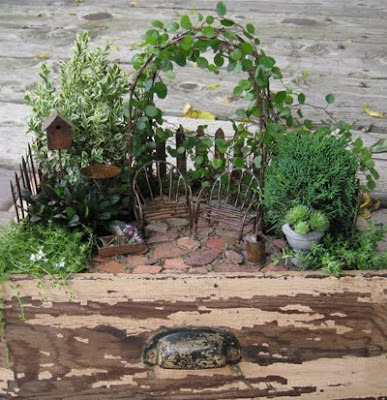 Lots of people at the Garden junk forum on Gardenweb make Fairy gardens if anyone want to see more go there and search for Fairy garden. Those look so cute! And thanks for reminding me about The Littles! I had forgotten about that show! ok. I'm so making a mini-garden. I even have a tiny bench that's just dying to be a garden bench. Beautiful idea, thanks for sharing! I just came across your blog and I love it! Oh ! I love everything that small ! What a cute idea... thanks ! I LOVE this! I do have a thing for miniatures and gardens - perfect combo. I even have left over mini champagne wire chairs my husband made for me after New Year's...guess I'd better get started! I loved the Littles and went through a stage as a kid where I longed and yearned in vain for fairies to come and visit me. But I'm still not making a tiny garden. I'm bitter now. Uh oh. Forgive me for saying fairies are imaginary. I have turned this blog into a hotbed of controversy. Now it occurs to me: would a realistic fairy garden also feature a giant pile of baby teeth? Or is a tooth fairy different from the kind that would live in small gardens? Somebody enlighten me. whoa this is straight out of CSI - what are you hersom grissom the mini killer??? So adorable! I might try one of these - it could be more manageable than a real garden. Thanks so much for the inspiration! Dangit, Jess! I just dropped $40 here 'cuz your post was so cute! Um, Sarah Sidle, you figured it out. I'm actually the cousin of the dollhouse miniature killer. I'm the sidekick of this season's demented laparoscopic killer, so you can expect to see dead fairies whose intestines have been tied into bows soon, lying in tiny gardens. Dede, that $40 will be a good investment if you actually get to see a real fairy. Or just end up with a cute garden. That is super cute! It could be functional too if you use your favorite herbs for the plants. This just makes me happy! Can not wait to do this. This is pretty awesome. I also love terrariums to house teeny tiny things. Wow, I didn't know that! I love Spirited Away. This one should be fun! Thanks for the news. adorable fairy plant pots as a gift. I made a Toad Garden instead, complete with toad homes! I love making these for my bargoers at brunch! They LOOVE THEM! xoxo, Madamchino!